There are few topics more controversial in modern American life than the right of citizens to own firearms. Proponents and opponents of the Second Amendment frequently invoke history in order to support their very contemporary concerns. It would therefore not be shocking if Stephen P. Halbrook’s new book, Gun Control in Nazi-Occupied France, made an appearance in some gun control debate in the very near future. It is worth highlighting that Halbrook’s book is not primarily concerned with the United States. 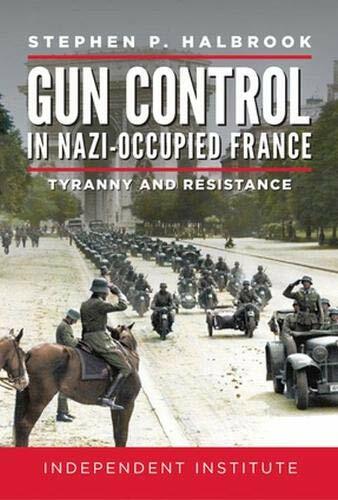 Rather, this book details how the occupying German forces in France utilized existing gun laws and made new ones in order to suppress the French population’s ability to resist after their country capitulated in 1940. Halbrook says here that there were two distinct epochs in the German occupation of France: the years 1940 to 1942 saw a somewhat lenient policy to gun owners in France, while, after the SS took command of German police activity in 1942, anti-gun measures became increasingly draconian. Even before 1942, however, Halbrook shows with incredible data and plenty of evidence that the Nazis handed out death sentences to intransigent French gun owners at an alarming rate. One of the main conceits of Gun Control in Nazi-Occupied France is the fact that centralized records of French gun owners made it much easier for the Germans and the collaborationist Vichy regime to round up and arrest gun owners after 1940. Specifically, in the wake of a right-wing putsch attempt in 1934 and continued Communist agitation, Pierre Laval, the President of the Council of Ministers, passed one decree-law in 1935 that mandated that all French gun owners had to register their firearms with the police. This piece of legislation, which was never voted on by French politicians, was done in the name of public safety. It would soon become a great benefit for the occupying Germans. Halbrook shows quite convincingly that millions of French citizens refused to listen to these laws. They hid their weapons (mostly hunting rifles and antique pistols and revolvers) in the country or in their own homes. Many of these weapons would wind up in the hands of the French resistance, although, until major Allied support came in 1944, the French underground was frequently short on weapons. This refusal to give up firearms cost many French citizens their lives. In one instance, 150 hostages, most of them imprisoned on firearms-related charges, were executed by the Germans for the single murder of a German Army officer. Such state violence was only possible in a country where men like Laval willingly collaborated with the Germans and the state itself had records detailing each and every legal gun owner in the country. In conclusion, Halbrook writes that it is very telling that armed civilians in France were the backbone of the resistance until the liberation of Paris in 1944. Therefore, Halbrook concludes that armed and motivated citizens can provide one of the strongest bulwarks against tyranny, whether foreign or domestic. Such a conclusion is in keeping with the spirit of the Second Amendment, but is unlikely to appeal to any proponent of greater gun control measures. Gun Control in Nazi-Occupied France is not a general interest history book, but it does discuss a very approachable topic. This monograph is convincing in its argumentation, even despite Halbrook’s rather dry and legalistic writing style. Gun Control in Nazi-Occupied serves as a reminder that totalitarian dictatorships in the 20th century, whether they were left wing or right wing, almost always disarmed its own citizens and those whom they occupied. The National Socialists disarmed Communists and Jews prior to starting the Second World War, and the Third French Republic tried to disarm its own people in order to maintain its weak grip on power. In sum, armed citizens, Halbrook shows, might not be able to defeat a modern army in battle, but they certainly can keep a power-hungry central state in check.